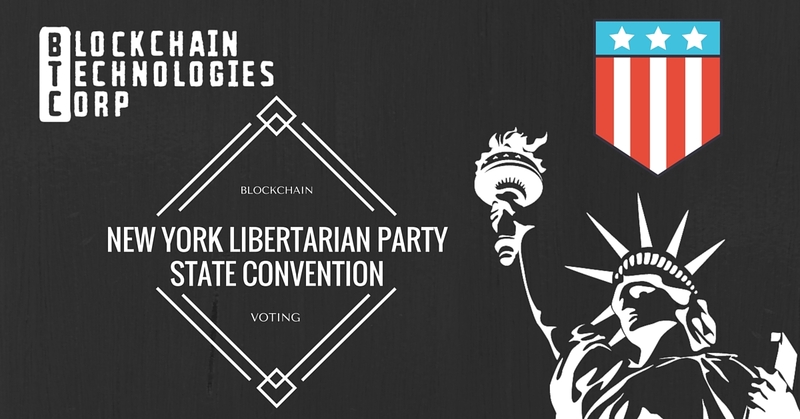 NEW YORK – Blockchain Technologies Corp. (BTC), the New York-based innovator in blockchain-based voting solutions, has been chosen by the New York Libertarian Party (NYLP) to provide balloted-election services during the party’s 2016 state convention. The event will cover election of officers, members of State Committee and delegates to National Convention, nomination of US Senate candidate, and approval of proposed by-law amendments. The blockchain – the protocol that underpins digital assets like Bitcoin and Florincoin – is the ideal location to safeguard privileged data like election results. Cutting-edge blockchain technology enables the creation of publicly viewable, time-stamped, signed records that are, once entered, virtually impossible to alter or delete. All election data — down to each individual ballot — is permanently recorded on a public blockchain database. Imagine the county clerk’s office or state voting authority — but governed by math, transparent by default, and absent human error. The NYLP 2016 State Convention will occur on April 30th and will feature party elections, a presidential debate, a seminar on effective dissent, and a live musical performance. For more information, visit their website. Blockchain Technologies Corp. is based in New York, NY. They bring sorely-needed technology and increased transparency to the election process. The company has filed a non-provisional utility patent on their blockchain voting systems. For more information visit their website, follow them on Twitter, or email info@blocktechcorp.com.